The Recipe: Fresh asparagus and pasta are such a lovely choice for a spring supper! This is one of those recipes that's way more than the sum of its simple parts, just fresh asparagus tossed with pasta in a light and lemony cream sauce, brightened with fresh dill. Lemon Asparagus Pasta Made the List! Lemon Asparagus Pasta is made ever-so-much easier with three favorite kitchen tools so indispensable that in spring, I haul them along when visiting family or friends and kitchen time is likely. For the asparagus, I rigged up a vertical asparagus steamer a couple of years ago but ready-made asparagus steamers [My Disclosure Promise] can be purchased at kitchen stores. If you love fresh asparagus, you’ll relish how a vertical steamer cooks the spears perfectly every time. Standing upright, the thick stems are closer to the fire so cook more, the tender tips further away so cook less. Perfection. UPDATE These days, I've banished my ad hoc asparagus steamer to the basement and instead, only cook asparagus in the microwave in five minutes. Here's how to microwave asparagus, so easy! And good too! For the lemons, a microplane (soooo many size and shape choices anymore!) is essential for creating piles of airy zest without nicking the bitter white pith. A lemon press, a clunky-looking, yellow-painted squeezing device, extracts the most juice possible from both lemons and limes. For the Parmesan cheese, it’s double-duty for the microplane. PASTA Cook the pasta in well-salted water and drain. LEMON CREAM SAUCE Meanwhile, in a large skillet, melt butter on medium heat, add shallot and slowly soften. Add half 'n' half, zest, lemon juice, salt and sugar and bring almost to a boil. Stir in asparagus and gently warm until the spears become tender. COMBINE Gently stir hot pasta into the Lemon Cream Sauce, letting it soak up the sauce. Gently stir in dill and black pepper. TO SERVE Transfer pasta to a large platter or individual pasta bowls and sprinkle with Parmesan, with lemon wedges on the side. Serve and enjoy! WHAT IS HALF 'N' HALF? A looong while ago, I asked what in retrospect was a really silly question on Twitter. What, I asked, is half 'n' half? I felt soooo embarrassed when someone gently answered, "half cream" and "half milk". DUH. Of course! In the U.S., cartons of half 'n' half is found in nearly every grocery, it's a real treat with the morning's coffee. 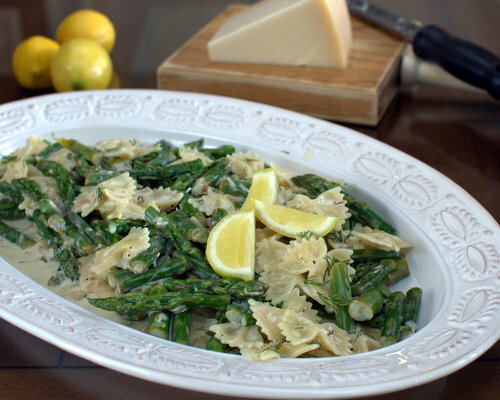 When I first published this recipe in 2008, to save calories, the ingredient list for Lemon Asparagus Pasta called for something called "fat-free half 'n' half". How do you make whole milk (4% butterfat) and heavy cream (36% butterfat) fat-free? Good question. In addition, on occasion, the fat-free half 'n' half separated. The taste was fine but the appearance was not as nice. Over time, I became uncomfortable with the highly processed fat-free half 'n' half product and happily returned to the real thing, calories be damned. ALANNA's TIPS For visual richness, I like to use a pasta with a big, interesting shape. Bow-tie pasta is perfect! Pasta is so rich that I have learned to allow just two ounces (about 57g) dried pasta per serving. I know, I know, this is <<< half >>> what most recipes specify. Still, I think you’ll find this pasta dish filling and satisfying because it’s packed with asparagus fiber and lemon flavor. But the first time you try the smaller portion, serve a big salad on the side, just in case. It takes a lot of asparagus to yield a pound (450g) of edible spears, which is what I'm shooting for in this recipe. The rhythm for removing the woody ends from asparagus is easy, think "bend, bend, snap, bend, bend, snap". I've even made a quick video for you, it's here in Asparagus & Woody Ends (Step-by-Step Photos & Video). Lemons vary in acidity. Some times I add no sugar at all, other times up to two teaspoons. No dill? No problem. Try fresh tarragon or basil, even inexpensive Italian flat-leaf parsley. VARIATIONS Rather than cooking the asparagus separately, next time I'll try dropping the asparagus into the boiling pasta water to briefly cook, then putting into a bowl of ice water to stop the cooking and retain the beautiful green color. CHICKEN? The last time I made this, I was so tempted to serve the pasta as a side with grilled chicken. Or better yet? Toss in some cooked chicken, in my kitchen that likely means a rotisserie chicken. SALMON? Or maybe some smoked salmon, either hot-smoked salmon or bits of Scandinavian-style gravlax or deli-style lox? In 2008, this recipe was my contribution to "Taste of Yellow", a LiveSTRONG cancer-awareness event hosted by an Australian food blog, Winos & Foodies. Not long after, our close-knit food blogging community was much saddened when Barbara passed away from cancer. NUTRITION INFORMATION Per Serving: 346 Calories; 11g Tot Fat; 6g Sat Fat; 30mg Cholesterol; 294mg Sodium; 52g Carb; 4g Fiber; 4g Sugar; 13g Protein. WEIGHT WATCHERS Old Points 7 & PointsPlus 9 & SmartPoints 11 & Freestyle 11 CALORIE COUNTERS 100-calorie serving = 1/4 serving (4g protein). Fresh asparagus is symbolic of spring and the return of an abundance of fresh produce. On my food blog A Veggie Venture, I've collected more than two dozen – imagine! – asparagus recipes. Here are a handful of my very favorite ways to cook and enjoy asparagus! Great recipe Alanna. I'm always looking for new ideas for pasta. This looks so easy and delicious. Thansk for supporting LiveSTRONG With A Taste Of Yellow. OH my gosh, I have every single ingredient. Except for real cream. It can't be worse, right? Supper! So simple - and so delishious! Thanks Alanna!! Simple and delish is right. My family gobbled this right up last night. They did want more but luckily I'd made an extra big salad. I've always said that if I ever won the lottery, the first three things I would do with my winnings is to : Get to a dentist to fix my horrible teeth, then eat more artichokes and asparagus!! If my budget allowed me to do so, I would eat asparagus and pee yellow every day! Until then, I'll drool over all your lovely asparagus dishes. The Green onion sauce with the farro asparagus is a must on my list! Barbara ~ Good luck with your event! Ali ~ You go, girl. Anon ~ Excellent! We've gotten out of whack with portion sizes and pasta, somehow, always seems 'free', like it's so insubstantial it should have no calories. But of course - it does. White on Rice ~ Ah yes, artichokes and asparagus together. When I bake asparagus I use the same theory - tips toward the door where it's a bit less hot! Alanna, here I am....it's great to see a seasonal veggie in all it's glory here. Thank you for mentioning my piece in BlogHer. I wanted to tell you that we made your lemon asparagus pasta last night and it was delicious. Paul ~ When I made this last spring, the fat-free half 'n' half did indeed curdle, you can see it in the photo and I mention it in Later Notes. But that had never happened to me before, otherwise I wouldn't have published the recipe. For the record, this affects appearance but not taste. Still ... it's on my list to remake once asparagus returns again.